Oldenburg, Bunderhee, Leer, August 31, 2018. The EWE ERNEUERBARE ENERGIEN GmbH from Oldenburg and the ENOVA IPP GmbH & Co. KG from Bunderhee have bought the wind farm Hohegaste in the East Frisian town Leer. Each company acquired 50 percent of the shares from the previous owners. The wind farm has been repowered in 2017: 13 of the older wind turbines of the first generation have been replaced by four Enercon 101 wind turbines with a total energy output of 12.2 MW. The purchase price is kept in silence. EWE and ENOVA will share the technical as well as the commercial tasks of the operation of the wind farm. EWE and ENOVA have been working together on projects in the energy transition for 15 years. In 2013 the energy provider and the wind farm project planner realized the first commercial off shore wind farm RIFFGAT in the German North Sea, among other projects. The ENOVA Group is operating as a family business since 1989 in the area of renewable energies. As an innovative pioneer with 30 employees, ENOVA develops, realizes and supports wind energy projects on shore and off shore. The services range from project initiation and realization to wind farm management, repowering and maintenance. 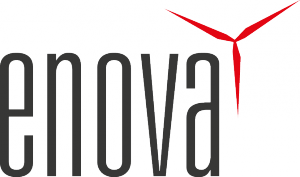 As a comprehensive project developer and energy service provider, ENOVA offers complete packages for operators and investors for the energy source wind. Nationwide cooperation with energy providers, municipals and forest administration see the reliability and know-how of the “ostfriesischen” wind power pioneers. With the founding of ENOVA IPP, the wind region is expanding its business model at its new location in Hamburg. As an innovative service provider, EWE is active in the fields of energy, telecommunications and information technology. The EWE Group combines its expertise in these areas to design a smart and efficient energy transition and to offer optimal solutions for its customers. In doing so, EWE focuses on partnerships, new markets and grabs the chance of digitalization. With more than 9000 employees and sales of EUR 7.6 billion in 2016, EWE is one of the largest energy companies in Germany. The company, headquartered in Oldenburg, Lower Saxony, is predominantly in municipal hands. It supplies the northwest of Germany, Brandenburg and the island Rügen, as well as internationally in parts of Poland and Turkey over 1.3 million customers with electricity, 1.8 million with natural gas and around 780000 with telecommunication services. For this purpose, various companies of the EWE Group operate about 205000 kilometers of energy and telecommunication networks. In the coming years, EWE will invest more than EUR 1.2 billion in an extensive fiber-optic expansion, creating the basis for the digitalization of the Northwest. Here we go! : The first construction work of the wind farm Düddingen in the district of Wesermarsch began on schedule in mid-march. The four older NEG Micon NM 1500-64 wind turbines from 2000 will be repowered by four new Enercon E-70 E4 wind turbines, each with a power output of 2.3 MW. The expected commissioning of the new plants is scheduled for the third quarter of 2018. With a hub height of 64 meters and a rotor diameter of 71 meters, the new wind turbines reach a total height of approx. 100 meters. They will produce more than 15,142,000 kWh of electricity per year. This is enough to supply just under 4000 households with renewable energy and save 9000 tons of CO2. On time and kept to the budget the repowering action of the windmill-powered plant Sanden finished after five months of construction in January of this year. The old engine, a Vestas V-66, got replaced by a new Enercon E-92. By repowering the annual energy output has nearly doubled. With a hub height of 85 m and a rotor diameter of 92 m the wind turbine generates an energy amount of approx 4.7 GWh/a. This supplies the energy requirement of more than 1100 households. The repowered wind turbine is located in the industrial area of Weener in Ostfriesland. Enova WEA Sanden from ENOVA Mitarbeiter on Vimeo. At the beginning of 2018 ENOVA took over the technical management of 71 MW of the portfolio of the EWE AG. In the tender ENOVA prevailed against a large number of competitors. “We are very pleased. Being able to use our know-how to increase the performance of the EWE portfolio is great,” says Ralf Brinkema, Head of Technical Operations Management. The wind farms will be transferred in two stages. By January 2018, 44 MW will be taken over by ENOVA, followed by another 27 MW in July 2018. The portfolio contains among others 1x ENERCON E112 with 4.5 MW, 1x E112 with 6 MW and 1x E126 with 7.58 MW. About one year ago, ENOVA reorganized its operations management. Over the year, 19 wind turbines with a total capacity of 60 MW have already been added to the portfolio. The acquisition of the EWE portfolio now underlines the successful realignment. Just in time for the turn of the year, ENOVA’s management breaks the 250 MW barrier. The special features of the ENOVA management are e.g. the use of independent monitoring software, the absorption of operator obligations, short reaction times and the theoretical as well as the practical skills of the employees. In particular, the practical experience of the technicians on ENERCON wind turbines ensures a balanced relationship between operator and manufacturer/ service provider. Since early 2017, ENOVA’s smart wind farm management offers a lean management with a focus on yield optimization, lifetime extension and compliance. Also worth highlighting is the need-based compilation of ENOVA service packages and modules: a small, smart package that only contains services that are necessary for a maximum energy output. 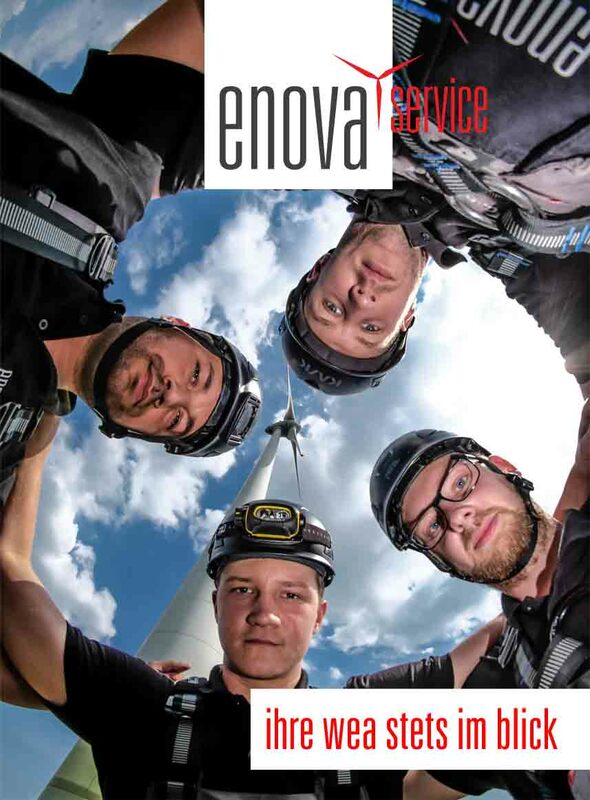 With a fresh breeze on the Husum Wind – The ENOVA Group extends its activities to include the business area Service / Maintenance. Since September 1st, the ENOVA Service GmbH offers its services in the area of service / maintenance. In the course of the expiry of the full maintenance contracts and the increased cost pressure, 15 gearless wind turbines of the 2 MW class were taken directly into our own service. The operators of the wind farms benefit from the good price / performance ratio and a fast and transparent service. At the end of the year at least another 11 wind turbines will be taken over by ENOVA Service. The services range from remote monitoring through maintenance and inspection to corrective repair. The concept is characterized by a quick troubleshooting, a cost-oriented pricing in the corrective repair, a transparent and rapid flow of information and the usual security of a manufacturer’s concept. On the 1st of September, six companies involved in the wind farm party of Börger had invited to their Windparkfest. (ENOVA Energieanlagen GmbH, ENOVA Windpark Börger Ohe 1 GmbH & Co. KG and ENOVA Windpark Börger Ohe 2 GmbH & Co. KG, as well as the energy parks Ohe GmbH & Co. KG, Ohe II GmbH & Co. KG, Sievers Energy GmbH & Co. KG and Ohe GmbH & Co. KG, which are mainly operated by citizen participations). The occasion was the ceremonial opening of the Börger Ohe 1 and 2 wind farms to the public, in which a total of eleven wind turbines will generate around 87,000 MWh of renewable energie each year. Project participants, regional politicians and public officials as well as property owners gladly accepted the invitation. And as befits a proper celebration, the appropriate entertainment was not missing: a desire for wind was created by a view gondola, which granted a view over the whole wind farms Börger, Börger Ohe 1 and 2 as well as Breddenberg Ohe and the opportunity to visit a wind turbine. Children were able to let off steam on the specially constructed bouncy castle and of course the physical well-being of all guests where taken care of in the large marquee. Since 1999, ENOVA has been active in Börger together with the municipality and acts as general contractor of all wind farms located there. In 2002, the old wind farm Börger was built, which has generated about 245,000MWh regenerative energy since then. In June 2016, the wind farm Börger Ohe 1 with four ENERCON E-115 / 3.0 MW wind turbines was put into operation. Just one year later, the commissioning of Börger Ohe 2 with seven ENERCON E-115 / 3.2 MW. Due to the new and old wind farms, the municipality of Börger contributes decisively to the energy turnaround: Annually a total of about 105,000 MWh of clean electricity is produced. The technical and commercial management of all parks is carried out by ENOVA. The Wind energy projector ENOVA Energiesysteme GmbH & Co. KG (ENOVA) and HANSAINVEST Real Assets GmbH (HANSAINVEST) have agreed on a long-term strategic partnership in the field of wind energy. This includes the establishment of a new company, an Independent Power Producer (IPP). The asset manager provides mezzanine capital to ENOVA IPP. The experienced family business will use this capital for the acquisition of own and third party wind farms. The investment focus is already on wind energy projects as well as those that are currently still in the planning and approval phase. The goal: By the end of 2019, more than 100 megawatts of power are to be acquired by the IPP. In a first investment step, ENOVA IPP has already acquired four wind farms with a total capacity of approx. 25 MW bought and financed by mezzanine capital. For HANSAINVEST, the investment in the strategic partnership means an expansion of the project portfolio and a steady and predictable cash flow over 20 years – with significantly leaner cost structures compared to conventional investment funds. “Our successful infrastructure investment strategy continues with the creation of ENOVA IPP. ENOVA is an experienced market player with an excellent track record. With this transaction, we secure a pipeline of attractive products. With ENOVA as a partner we can invest in a diversified project pipeline – even in less windy years, this structure allows for a safe return on invested capital with an attractive risk-return profile, “says Nicholas Brinckmann, Managing Director of HANSAINVEST Real Assets. Independent Power Producers, or IPP for short, in the electricity industry are those operators of power plants and other types of electrical generation systems who, unlike “traditional” power companies, do not have their own power grid to control the transmition and distribution of the produced electrical energy. ENOVA was supported in this transaction by esmera.partners and PWC Legal, HANSAINVEST by fieldfisher, Baker Tilly and TÜV Süd. The ENOVA group has been a family business since 1989 and active in the field of regenerative energies. As an innovative pioneer with more than 30 employees ENOVA developes and supportswind energy projects on land (onshore) and at sea (offshore). The range of services extends from the project initiation and realization to Wind farm management, repowering and more recently also maintenance / service. As a more comprehensive Project developer and energy service provider offers ENOVA for land owners, operators and energy providers Investors complete packages for projects with the energy source wind. HANSAINVEST Real Assets GmbH stands for many years of experience and sustainable Investments in the real estate and infrastructure sector. In total, about 80 employees serve Assets of around 4.3 billion euros. In the real estate sector, the internationally established experts manage office, retail, hotel, Logistics and residential real estate in 18 countries. In addition to portfolio management, both the Areas of buying and selling as well as asset management and project development. The latest product is the HANSA US Residential, an open special-AIF focusing on US residential real estate. In the area of Infrastructure, the international portfolio of infrastructure investments with a Volume of around € 700 million managed. Other services include the acquisition of assets as well as the current portfolio management (state of the data: 31.12.2016). From the 12th to the 15th of September we will be in Husum. You will find us in hall 1 and we look forward to welcoming you to our stand. If you need more information, or would like to arrange a specific appointment with us, you can contact us on 04953-9290-0 or send an email to info@enova.de. Less than two months ago, ENOVA initiated its public participation in the Breddenberg Ohe project. Around 40 investors invested in a project entitled “Breddenberg Ohe” within a few weeks via a qualified subordinated loan. With an issue volume of € 300,000, citizens are financing the new wind farm in the municipality of Breddenberg. Both E-115 E2 wind turbines are in operation and have been feeding electricity into the electrical grid since March and May 2017 respectively. We say thank you and look forward to a 10-year cooperation. Subscription of our new citizen participation Breddenberg Ohe now possible! Just in time for the end of 2016, the first public participation of the ENOVA Group was completely placed. Over 60 citizens have placed their trust in us and are sub-financiers of the two wind turbines in the municipality of Börger. We would like to build on this positive response and open up another investment for our wind farm in Breddenberg Ohe. In the immediate vicinity of the existing wind farm Börger Ohe 1, we are building two wind turbines with a nominal capacity of 3.2 MW each. Citizen participation is set up for both ENOVA-operated wind turbines. They participate via a qualified subordinated loan with an issue volume of € 300.000 and a fixed interest rate of 3.75%. The term is fixed on 30.06.2027. You will receive your profits, for the first time on 31.12.2017, from the direct generation of energy in the form of interest. Invest in a meaningful project and bring a breath of fresh air into your home. All natural and legal persons can subscribe to the investment. https://www.enova.de/wp-content/uploads/2017/12/P1030292-e1498470539871-773x1030.jpg 1030 773 ENOVA https://www.enova.de/wp-content/uploads/2013/04/Unknown-300x177.png ENOVA2017-06-26 17:51:552017-12-11 17:52:31Subscription of our new citizen participation Breddenberg Ohe now possible!